Bain Capital bought a 50 percent stake in the hip shoemaker, hoping to build on its success. It didn’t go as planned. When popular footwear seller Toms Shoes LLC scored a $313 million investment from private equity giant Bain Capital back in 2014, the retailer was poised to grow in a serious way. 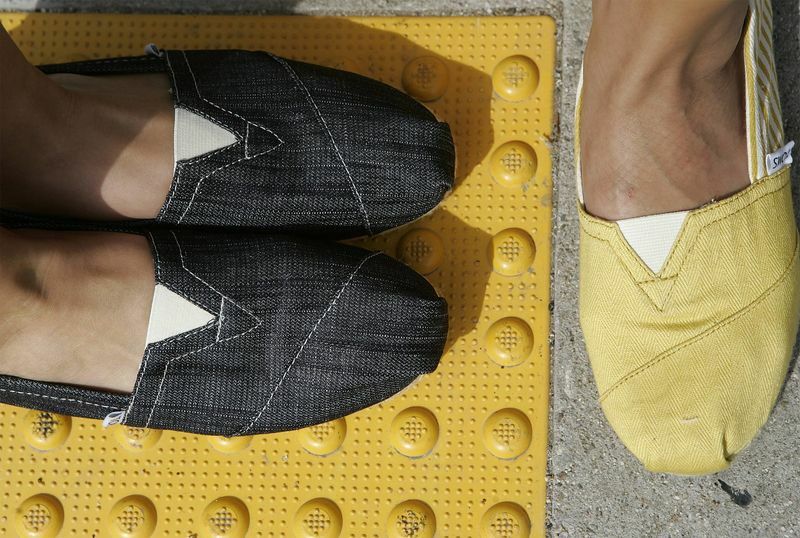 Valued at more than $600 million, Toms was seen by Wall Street as a rising star. A perfect storm of aggressive competitors, a failure to diversify and the implosion of U.S. retail quickly followed. Four years later, Toms is squirming under a load of debt and struggling to attract new shoppers. Earnings are down by more than half since the Bain deal, and the shoemaker is burning through cash, rating agencies warn. Last year, Toms replaced its longtime finance chief with Deb Rieger-Paganis, a director from corporate advisory and restructuring firm AlixPartners LLP. In December, the company asked Bain for an additional $18 million to support daily operations. While Toms booked $91 million of revenue in the fourth quarter, according to a person familiar with the data, only $8 million of it was profit. The revenue figure did represent an increase over the prior year, but it fell short of where investors thought Toms would be by now. More ominously, Toms debt is trading below 70 cents on the dollar, which means the market is worried it won’t be paid back in full. Toms has about $350 million in total debt, close to 15 times a measure of its annual earnings, according to a December report from Moody’s. Typical distressed retailers average debt loads closer to five or six times earnings, metrics by Fitch Ratings state. 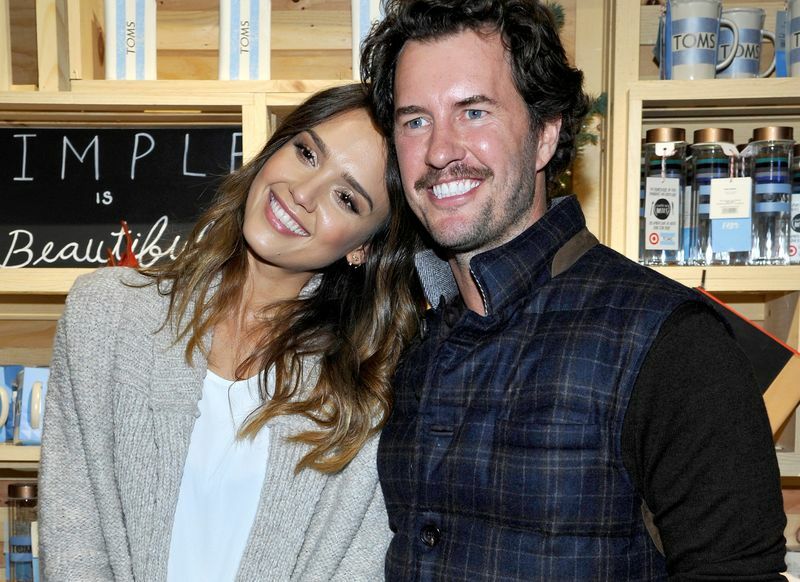 Jessica Alba and Toms Shoes founder Blake Mycoskie. While Toms’ sales slump began before Bain got involved, the pairing has nevertheless done little to resolve the retailer’s problems, which have since accelerated. Bain declined to comment and Mycoskie couldn’t be reached for comment. Analysts said the shoemaker’s big mistake was its failure to move beyond a staple style. Years after Bain pledged to help it expand, Toms’ $54 trademark “Alpargata” slip-ons still draw 50 percent of its business, and almost 96 percent of its sales derive from footwear, according to Moody’s. When retail hit an industry-wide slump, Toms’ other products weren’t as successful at capturing the imagination of shoppers. “Toms basically was a one-product company,” said Diane Shand, senior director of the consumer products team at S&P Global Ratings. In retail, that’s often a recipe for disaster. The Alpargata was once a true fashion phenomenon. Toms’ signature shoe became a trendy casual alternative to sandals or sneakers. Not only did they look good on the celebrities who wore them, but their charitable backstory resonated, too. Jessica Alba would don Toms while shopping or traveling. Ellen Pompeo wore them to the hair salon. Zac Efron even played golf in them. Few shoe styles have the fashion flexibility to be worn by both Anne Hathaway and Ozzy Osborne. These did. Toms did try to build up other products. Over the years, it’s released a variety of shoe styles in order to branch out. There were lace-up sneakers and suede brogue dress shoes for men, cork wedges and chunky heel sandals for women. The company collaborated with celebrities and high-end labels to build hype, from Charlize Theron and Ben Affleck to Jonathan Adler and Prabal Gurung. Yet none of those ever really took off, leaving Toms reliant on that one shoe. Mycoskie, 41, founded Toms in 2006 after taking a trip to Argentina to learn to play polo. When the Texan wasn’t on horseback, he was touring the outskirts of Buenos Aires, where he encountered barefoot children who couldn’t afford shoes. Intrigued by Argentina’s popular loafers, the Alpargata, he wondered how the shoes would sell back home. Suddenly, he had an idea: He would bring them to the U.S. market; for each one sold, he’d donate a pair. Mycoskie has conceded that he wasn’t suited for the C-suite. A former contestant on the reality show “The Amazing Race,” he had run several of his own small operations, among them an outdoor billboard company, a dry cleaner and a driver education service. At Toms, he called himself “Chief Shoe Giver” instead of chief executive officer or president. With a head of scruffy brown hair and a wardrobe of chambray shirts and friendship bracelets, Mycoskie didn’t think of Toms as much more than a fun project—at least at first. “I was CEO by default, but I never was a CEO,” the entrepreneur told Business Insider in 2016. “I mean, I’m a founder, I love the beginning of things. I love working with the creative team, but running a business—dealing a lot with H.R., dealing a lot with processes—that’s never really been my strength.” In his 2012 book, Mycoskie admitted he’d made mistakes at Toms, and that he had originally set out to be a “rock-star business leader” or “cult CEO.” But that desire eventually disappeared. As part of the 2014 deal with Bain, Mycoskie retained his shoe-giver title, but was replaced as head of the company. He went on to start a social entrepreneurship fund, but remained a 50 percent owner of Toms. In his place, Bain installed Jim Alling, a former T-Mobile USA executive. An experienced operator who was responsible for servicing millions of users at the wireless carrier, Alling had previously held executive roles at Starbucks Corp. and Nestle SA. At Toms, he streamlined operations, cutting some of Mycoskie’s initiatives in favor of its shoe business. Long-term, however, he hoped non-footwear items would account for a third of sales. Before Alling’s arrival, Toms was already trying to wean itself off shoes. It wanted one new product paired with a giveaway each year. 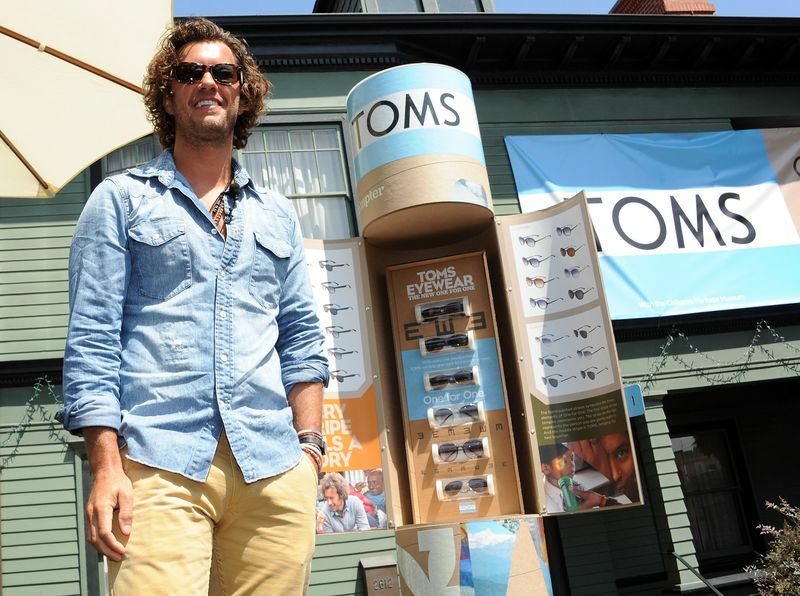 In 2011, it launched Toms Eyewear, a line of sunglasses in partnership with Seva Foundation, an eye care nonprofit. In 2014, it created Toms Roasting Co., a coffee business that partnered with Water for People, which promotes access to clean drinking water. Even after Bain’s buy in, Toms was still pursuing its philanthropic product strategy. In 2015, it started selling canvas tote bags with the promise that funds from purchases would go to aid safe births. The company subsequently decided to refocus on its core business, according to a person with knowledge of the business strategy. Mycoskie at the celebration of the new One For One Toms eyewear product launch. Meanwhile, imitators were siphoning off customers from the one thing Toms was really good at. Skechers created a shoe it called “Bobs,” which mirrored Toms’ design, mimicked the charitable model and sold for half the price. Soon, such discount stores as Target Corp. and Payless ShoeSource Inc. were making their own versions, further diluting Toms’s appeal. Shoppers started to realize that the math didn’t add up. The promise of a donated pair didn’t justify spending $54 on shoes they could find elsewhere for $20 or less. Nevertheless, some segments of Toms’ business do show positive momentum, perhaps auguring the turnaround the company sees coming: E-commerce sales grew 56 percent in the fourth quarter as marketing strategies drove more traffic to its website, and retail sales in the U.S. were up 50 percent compared with the prior year. The deal that landed Bain its stake in Toms was part venture capital, part leveraged buyout. 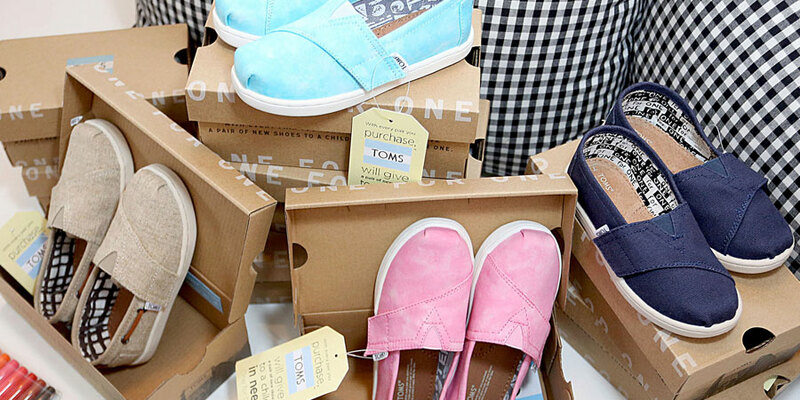 The private equity firm financed its 50 percent share purchase with a combination of new equity—a $169 million check—and debt issued through Toms, in the typical style of private equity-backed takeovers. The investment was supposed to help Toms grow up by lending corporate expertise and resources to a company still operating like a startup. Instead, it followed a model that’s become all too familiar to struggling retailers: Buy the company with its own debt, ideally while taking generous fees for the transaction, and then operate it on a budget. In Toms’s case, the additional debt burden soon became onerous. The $307 million term loan sold by Toms in 2014 will come due in October 2020. A further $80 million loan is to expire in October 2019. In the best of scenarios, leveraged buyouts let businesses use debt to grow quickly and then repay it with ramped-up earnings. But the world of retail is one of small and shrinking margins. As a result, many acquisitions in the sector have struggled to bring in enough cash to cover their interest payments, let alone principal when it comes due. Claire’s, Nine West, Gymboree and Aeropostale are just a few private equity-backed retailers to have filed for bankruptcy in recent years. PetSmart Inc. is in crisis after BC Partners bought it with more than $8 billion of debt in 2015. In perhaps the highest-profile example yet, Toys “R” Us sought court protection last year, when it could no longer afford annual interest payments of more than $400 million.